Many patients in Baton Rouge choose veneers to create a more attractive, youthful-looking smile. Baton Rouge Cosmetic Dentist, Dr.Galliano, has helped countless patients achieve a more natural-looking smile with porcelain veneers. In his practice, Dr. Galliano uses Elite Porcelain Restoration veneers, which are created using a special technique that combines different opacity porcelain layers to provide a beautiful natural smile. Providing leading-edge treatment and quality dental care to patients through Veneers in Baton Rouge for more than 33 years, Dr. Galliano has earned Fellowship and Master’s Certifications from the Academy of General Dentistry. Dr.Galliano set out to achieve the two highest honors in dentistry in order to be able to provide the highest quality and care for his patient family. Cosmetic dental work, such as Veneers, require detail oriented skill sets, as well as an artistic eye in order to achieve a beautiful natural looking smile. This procedure will not successfully just fall into place, it can only be achieved with specific intention from the dentist. Dr. Galliano is passionate about his work, he approaches all cosmetic dentistry cases big or small with intricate protocols and study models in order to properly restore his patients teeth for both optimal function and aesthetics. For a natural appearance and long lasting results, Dr. Galliano uses full coverage Veneers that cover the entire tooth. This provides added strength and aesthetics for our patients looking to improve their smile. 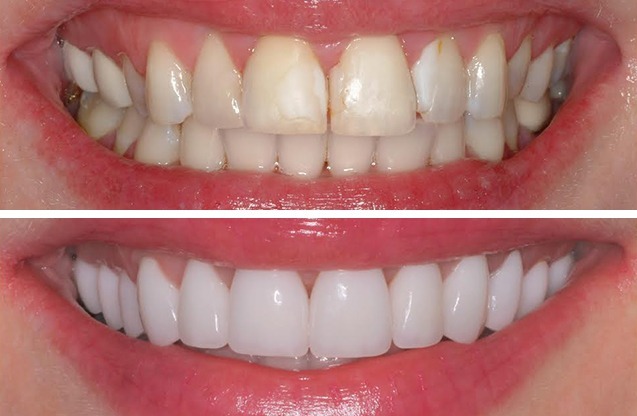 Veneers can be used to improve a wide variety of cosmetic dental concerns such as discolored or stained teeth, closing gaps between teeth, correcting a smile that is uneven or crooked without the need for braces, and repairing chips and other imperfections. Although some veneers can be made with resin composite materials, porcelain veneers are more stain-resistant and look more like natural teeth. Dr. Galliano can help you decide if veneers are the right choice to help you improve the look of your teeth. During the procedure, the teeth that will receive a veneer are “shaped” or brought down in order to cover them with a full coverage beautiful veneer. An impression is made and temporary veneers are cemented on for two weeks until the final Veneers are made . Dr. Galliano makes specific modifications and measurements during this visit in order to have our laboratory technician fabricate the unique final product of your beautiful veneers. The second visit is where the veneers are permanently cemented on and we give you back the smile you want and deserve. You can have the smile you desire, Please contact us today to set up a Cosmetic Dental consultation from your Baton Rouge Dentist, Dr. Galliano, DDS. What are Veneers are used to fix? Will Veneers look like Fake Teeth? No. Your Veneers will not look like fake teeth, Dr.Galliano has over 33 years of experience and skill in creating beautiful natural smiles.